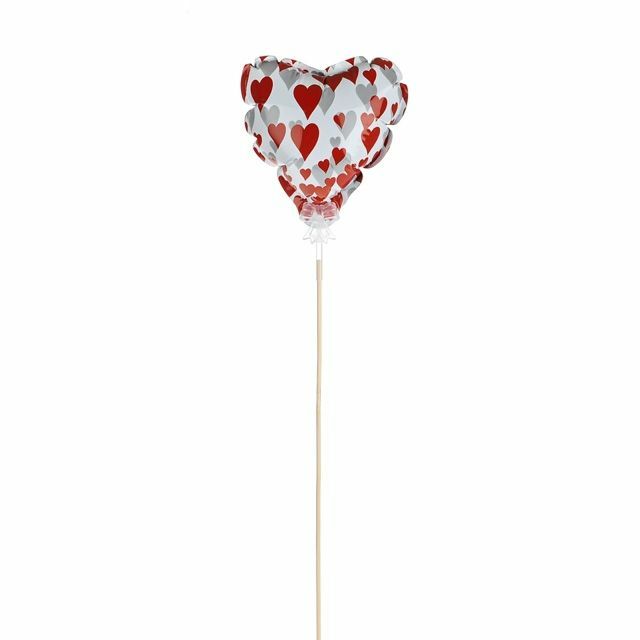 Balloon Heart On Pick: this Heart balloon comes on a stick to put in a bouquet. Available Size: Overall height approx. 50cm, balloon measurements 12.5cm. Design Highlight: add something extra to an arrangement or bouquet! Occasions: valentine's day, christenings, weddings, birthdays, christmas and anyother event, function or celebration! Our Balloon Rose On Pick will amaze you with its natural and life like appearance. This make for a wonderful option to upgrade the décor of your home or bouquet. These gorgeous Balloon Heart On Pick, add to your contemporary vases, display or bouquet are perfect. Designed meticulously by a skilled team. Just Artificial gives you the benefit of capturing the beauty of flowers in your home without the caring associated with grooming real plants or maintaining a garden. Also, explore an expanding inventory of decorative items for home decoration, craft projects and some interesting artsy accessories. Valentines Day 2019 Delivery Advice: Valentine's Day is on Thursday 14th February in 2019 and to ensure good time for delivery our last recommended order date for Standard delivery (subject to stock) is Midday Friday 8th February 2019. We can upgrade the service (for a small additional fee) to a Next Working Day Courier if needed (you should select this method during the checkout process in your basket), in which case the last recommended order time would be Midday (12pm) Tuesday 12th February as above, for delivery Wednesday 13th needing a signature on delivery (subject to stock). Someone must be in to accept the delivery, the courier may leave them in a designated safe/dry place if you leave a signed note, but this is at your own risk. Please call us for details and advice if unsure. Q: I am looking to place a large order of this item please could you check stock availability and lead times on this product? No problem at all, we hold general rolling stock but also have regular new stock shipments arriving - if you email us our six digit product ID (found above when a product is selected) preferably with the colour and size too and the quantity you are interested in. We would also need to know any particular dates you would need delivery for if you was to proceed with an order. We will then find out for you and let you know availability ASAP, no obligation. If you have a budget to stick to this would be a good time to let us know too, that way if we know of a similar product that we feel might be more suited to help keep within your budget we can look into that for you at the same time and then give you all the options and suggestions. Preset Questions Enter your own question below... What is the lead time on this product? Just Artificial want you to be happy with your purchase - if you are not completely satisfied with your product, simply let us know within 14 days of delivery (or if your product is faulty or damaged within 24 hours of delivery) and you can return the goods to us within 14 days of letting us know, for a refund or exchange. If your product is made to your own specifications and sizes or we ordered in extra stock to satisfy your order requirements or the product information states the product is non refundable and non returnable, then it is classed as a bespoke non standard item and is non refundable and non returnable. Please see our Terms & Conditions for more detailed information at the very bottom of the page.